Duratron PAI is the highest performing, melt processable plastic. It has superior resistance to elevated temperatures. It is capable of performing under severe stress conditions at continuous temperatures to 500°F (260°C). Parts machined from Duratron stock shapes provide greater compressive strength and higher impact resistance than most advanced engineering plastics (See Figure 22). Duratron PAI's extremely low coefficient of linear thermal expansion and high creep resistance deliver excellent dimensional stability over its entire service range (see Figure 23). 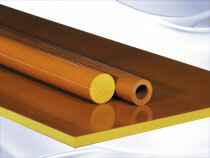 Duratron PAI is an amorphous material with a Tg (glass transition temperature) of 537°F (280°C). Duratron PAI stock shapes are post-cured using procedures developed jointly by BP Amoco and Mitsubishi Chemical Advanced Materials. This eliminates the need for additional curing by the end user in most situations. A post-curing cycle is sometimes recommended for components fabricated from extruded shapes where optimization of chemical resistance and/or wear performance is required. For large shapes or custom geometries like tubular bar, compression molded Duratron PAI shapes offer designers the greatest economy and flexibility. Another benefit of selecting a compression molded grade is that resins are cured, or "imidized" prior to molding which eliminates the need to post-cure shapes or parts fabricated from compression molded shapes. Popular extrusion and injection molding grades of Duratron PAI are offered as compression molded shapes. Typically, you can identify a compression molded grade as having a second digit of "5" in the product name. Duratron T4203 PAI offers the best toughness and impact strength of all Duratron PAI grades. This extruded grade is very popular for precision parts in high-tech equipment. In addition, its good electrical insulating ability provides numerous possibilities in the field of electrical components. Compression moulded Duratron T4503 PAI is similar in composition to Duratron T4203 PAI, and is selected when larger shapes are required. This grade is commonly used for dies and patterns of formed metal parts or as thermal insulators. It is similar in composition to Duratron T2503 PAI, and selected when larger shapes are required. This Duratron PAI is primarily used for wear and friction parts. It offers a very low expansion rate, low coefficient of friction and exhibits little or no slip-stick in use. Duratron T4301's flexural modulus of 1,000,000 psi, is higher than most other advanced engineering plastics. This grade excels in severe service wear applications such as non-lubricated bearings, seals, bearing cages and reciprocating compressor parts. Duratron T4501 PAI is well suited for general purpose wear and friction parts. It has a higher compressive strength and can therefore carry more load than Duratron T4540. It is similar in composition to Duratron T4301 PAl, and selected when larger shapes are required. This seal and bearing grade offers a very low coefficient of friction and good wear properties. It was developed specifically for use in rotating equipment. Its composition is the same as the former Duratron T4340 PAI polyamide-imide and used when larger (especially tubular) shapes are required. Typical applications for Duratron T4540 PAI include labyrinth seals, wear rings, bushings, and bearings of all types. Duratron T5030 PAI is 30% glass-reinforced. It offers high rigidity, retention of stiffness, a low expansion rate and improved load carrying capabilities. This grade is well suited for applications in the electrical/electronic, business equipment, aircraft and aerospace industries. Duratron T5530 PAI is 30% glass-reinforced. It is ideal for higher load structural or electronic applications. This grade is similar in composition to Duratron T5030 PAI. It is selected for larger shapes or when the greatest degree of dimensional control is required. Duratron T7130 PAI is 30% carbon fiber-reinforced. It offers exceptional stiffness, nonabrasive wear performance and the lowest coefficient of thermal expansion of all materials profiled in this guide.